Skipper Paddy Bradley rose magnificently to the occasion to get his side out of jail at Castlebar as Derry defeated Limerick 0-13 to 0-09 in this third round qualifier. The Glenullin man thumped over a couple of mammoth frees to finally kill off Limerick's brave challenge as the Oak Leaf men took their loyal supporters on yet another qualifier adventure. Semi-finalists last season, Mickey Moran's side are back in the last 12, but Moran was insisting that he will be taking it one game at a time. The sides were level with 15 minutes to play at McHale Park, but the injury-ravaged Ulster men stepped it up in the final stages to make it through to round four. The defeat marked the end of an era for Limerick football, manager Liam Kearns confirming his departure in an emotional dressing room after six years in charge. Derry suffered a pre-match blow when it was confirmed that Enda Muldoon would play no part due to a hamstring injury picked up in a club game. But they made an encouraging start, with Sean Martin Lockhart making the penetrating run which set Gavin Donaghy up for the opening point. A superb Paul McFlynn point, created by fellow half back Francis McEldowney, and a Paddy Bradley free, made it 0-3 to no score with 12 minutes played, and Limerick supporters were still waiting for their team to start performing. Once they got the nerves settled, however, they did create problems for the Oak Leaf defence, with Stephen Kelly and Michael Reidy proving a handful. Kelly hoisted his side's first score in the 15th minute, and a Muiris Gavin free narrowed the gap to one. 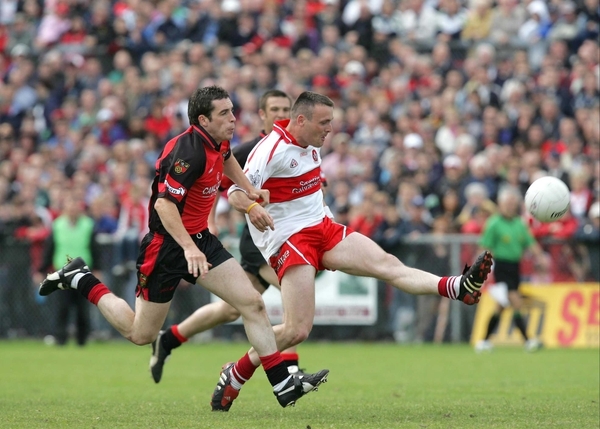 But Kevin McCloy and Lockhart soon took control of the situation, and Derry's three points cushion was duly restored. Bradley played a short free to younger brother Eoin and took the return to slot over a neat score, and Mark Lynch curled over a gem from distance to make it 0-5 to 0-2. Limerick had another spell, however, and two Gavin frees stretched the Ulster men, but they finished the half strongly when Eoin Bradley drove a '45' into the wind and between the posts for a 0-6 to 0-4 interval advantage. Referee John Bannon, injured in a collision with Lockhart in the 23rd minute, failed to appear for the second half, with Mayo's Michael Daly taking the whistle, and Derry had a close shave when a Seanie Buckley volley was superbly saved by Barry Gillis. And when the accurate Gavin punished indiscipline in the Derry defence with two more frees, the Treaty men were just a point adrift at 0-7 to 0-6. With John Galvin pushing forward at every opportunity, and Kelly running strongly, they worried the Derry defence, and Gavin just couldn't miss his frees, bringing his tally to eight as the Treaty County drew level at 0-9 each with 15 minutes to play. But Derry regrouped, and their opponents failed to score for the remainder of the game. 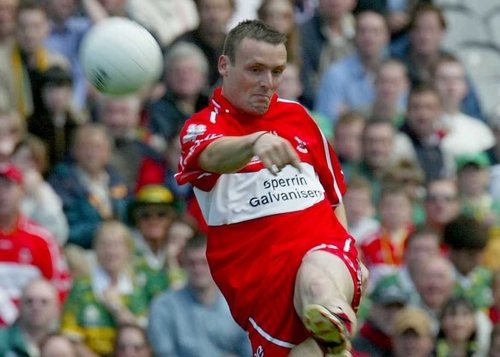 The introduction of Conleth Gilligan steadied the ship, and with the Bradley brothers now combining in a two-man inside line, things began to happen for Mickey Moran's side. Paddy Bradley played a captain's role in the closing stages, thumping over a couple of massive frees which secured Derry's passage to the last 12. Derry: B Gillis, K McGuckin, K McCloy, M Kelly, F McEldowney, SM Lockhart, P McFlynn (0-1), J McBride, Patsy Bradley, P Murphy, E Bradley (0-3, 1 '45'), G Donaghy (0-1), M Lynch (0-2, 1 free), Paddy Bradley (0-6, 4 frees), C Devlin. McEldowney, P Wilson for McFlynn. Limerick: S O'Donnell, T Stack, C Mullane, J McCarthy, P Browne, S Lucey, M O'Riordan, J Quane, J Galvin, S Kelly (0-1), M Gavin (0-8, 7 frees), S Buckley, C Fitzgerald, M Reidy, M Crowley. Subs: J Stokes for Quane, J Donovan for Reidy, M O'Brien for Buckley. Referee: J Bannon (Longford) (replaced by Michael Daly (Mayo)).